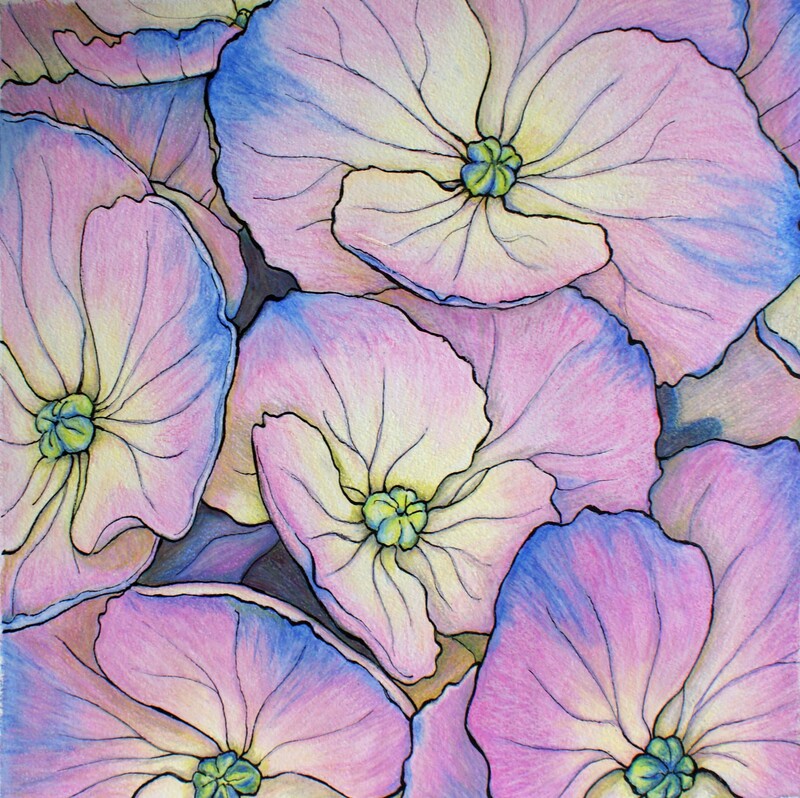 Here is the second in the Hydrangea series. A more pastel rendition this time, not a colour palette I am used to working in, so a challenge in itself. 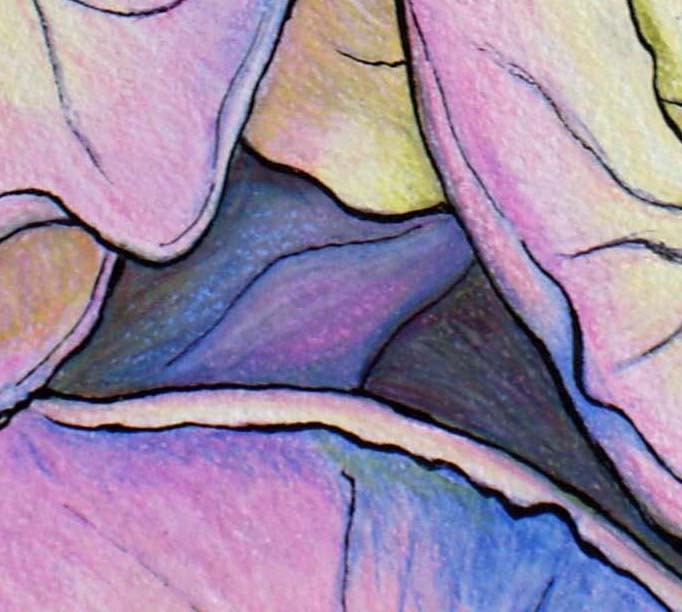 I added the veins into these petals, not sure if I am going to go back and add them into the first one. I will wait until I have finished the series before I go back and do the last fiddle with them all. I would like them to work together as a set, but we will see as they are completed as to how cohesive they are. The area on the right behind the petals needs some work, just not sure what to do with it yet. it seems too pale, I may make it darker, just need to ponder on it for awhile. I really like the details in this painting so I thought I would share with you some of my favourite bits. In my previous post I was talking about our lovely autumn weather, well I spoke too soon, It has been hot, really hot for a lot of days now, I think we may go to 10 days straight over 30C (90F) and today and tomorrow will be 36C (100F). Now I love the hot weather but this is taking it a bit far. I will have to go and immerse myself into the cool hydrangeas again. I am thinking of taking a little detour in my techniques and looking at combining my pencil work, with some paper embossing and creating a little 3D work. It is an idea I have been kicking around for awhile so I may have something new to show you. Thank you Karen for your encouragement and Michelle I hope you like this installment. This entry was posted in 2013 Artwork, Flowers from the Garden and tagged art, colored pencil, coloured pencils, drawing, drawings, flower, flowers, Hydrangea, painting. Bookmark the permalink. Well definitely worth waiting for. I now need to compare the two pieces of work – need to split screen it somehow. Thank you for uplifting my Monday with beauty. I’m glad you did the closeups because it’s great seeing the complexity of colours you mix in there, and I love the organic quality of the ink work. I think htis series is beautiful. This one sort of glows. 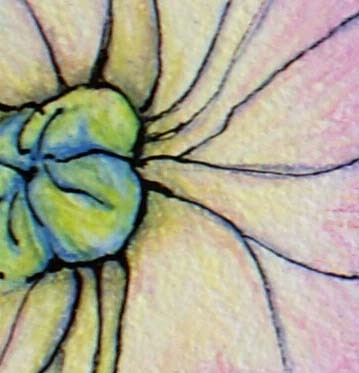 The colours you have used in this one are great, it has a lovely rhythm to it. Hydrangea 2 has now become my favourite. Funny what a bit of time brings. It reminds me of sitting and looking at Monet’s Waterlily Series in Paris, and the more I sat and looked the more I was drawn in to every nuance and breath of Giverny air. Seeing something new in each look.